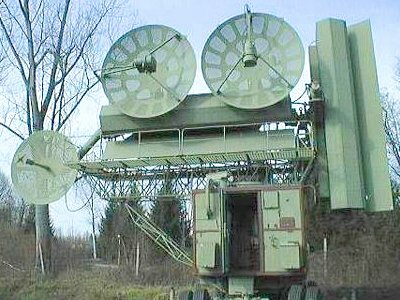 “Fan Song E” is a G-Band missile control radar associated with the SA-2E Guideline Mod 4. The main differences are the frequency of the radiation from the Lewis scanners and the fan beam (and hence the sector dimensions). The beams in Fan Song E are about 7.5° wide in the fan and 1.5° in the scanning direction. In addition to the antenna for the command guidance signals, which is similar to that of Fan Song B, Fan Song E has two further parabolic dishes mounted on top of the horizontal Lewis scanner (one for each scanner). One of these is vertically and the other horizontally polarised, and their purpose is to provide a Lobe-On-Receive-Only (LORO) feature. This is an Electronic Counter-Counter Measures (ECCM) technique in which the scanner action of the Lewis scanner is restricted to the receive channel by diverting the transmitted signal, which would otherwise be radiated from the scanner, into a dummy load. The signal is then replaced by a signal from one of the parabolic dishes of sufficient power to operate the whole system. 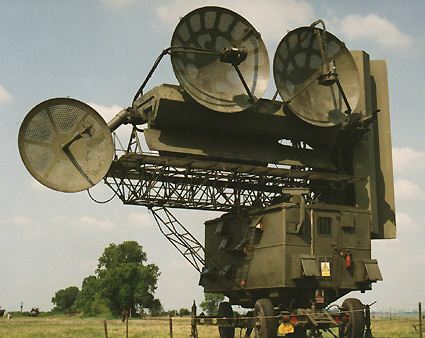 Fan Song radars are in widespread use in many countries, associated with the SA-2 missile system. The SA-2 is being replaced by the SA-10 and it is expected to be out of service by the year 2000. Outside the Russian Federation and Associated States, countries identified as having used the SA-2 missile comprise Afghanistan, Algeria (reportedly 24 launchers), Bulgaria, Cuba (approximately 60 launchers), the former Czechoslovakia, Egypt, Ethiopia, Hungary, India, Iraq, North Korea, Libya, Mongolia, Poland, Romania, Somalia, Sudan, Syria, Vietnam and the former Yugoslavia.